A new paper published in Quaternary Science Reviews reconstructs temperatures in Iceland and finds summer temperatures during the 1930's were about the same as at the end of the record in ~2002. Following the 1930's, temperatures plunged almost 2C by the time of the ice age scare of the 1970's, and then recovered to temperatures similar to the 1930's. The authors attribute these climate changes to cycles of natural ocean oscillations [NAO & AMO], and there is obviously no relation to the slow steady rise in CO2 levels over this period. Iceland summer temperature reconstruction is shown in the 2nd graph from top. Spectral analysis of a 3000-year-long varved sediment from Iceland. There is a correlation between varve thickness and summer climate parameters. Some of the spectral peaks show NAO and AMO-like behaviour. The NAO and AMO cycles are not stationary through the 3-ka record. The NAO cyclicity is strongest during the LIA while the AMO cyclicity is absent. A 3000-year varve-thickness record from Hvítárvatn, a glacier-dominated lake in central Iceland, preserves inter-annual variations in the delivery of glacially eroded sediment to the lake. The first-order low-frequency trend in varve thickness reflects increased glacial erosion through the Late Holocene, reaching a peak during the Little Ice Age (LIA). Superimposed on this trend are large inter-annual to decadal fluctuations in varve thickness that we suggest reflect variability in climate parameters that determine the efficiency of the fluvial transport system to deliver glacially eroded sediment to the lake each year. We use spectral analysis to test whether regular high-frequency cyclicity in varve thickness exists in the 3-ka record after removing the low-frequency variability. Spectral analyses from three sediment cores recovered from the lake show essentially the same periods of 2.8–3.4, 13, 35–40 and 85–93, for the overlapping ∼900-year period. Additionally, cycles of 55, 130 and 290 years are found in the spectrum for the 3000-year record that do not show up in the spectra for the shorter cores. Some of these cycles show similar variability to those of the North Atlantic Oscillation (NAO) and Atlantic Multidecadal Oscillation (AMO). 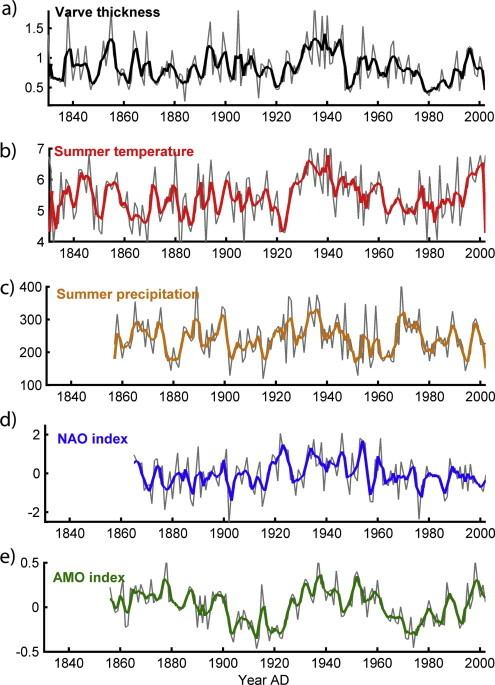 This relationship is supported by a significant correlation between varve thickness and both the NAO (precipitation) and AMO (summer temperature) indices over the 180-year instrumental period. NAO cyclicities (2–15 years) are weakly expressed in the first half of the record, increase between 600 and 1000 AD, decrease in strength during medieval time, and are most strongly expressed between 1300 AD and the early 20th century. AMO cyclicities (50 to 130 years) are also relatively weak in the first half of the record, becoming quite strong between 600 and 1000 AD and again between 1100 and 1500 AD, but are essentially absent through the peak of the LIA, between 1500 and 1900 AD, a time when strong cyclicities of about 35 years appear.